Kris Jenner says she is NOT banging the guy she took to Kim Kardashian's birthday party ... but who is she kidding? 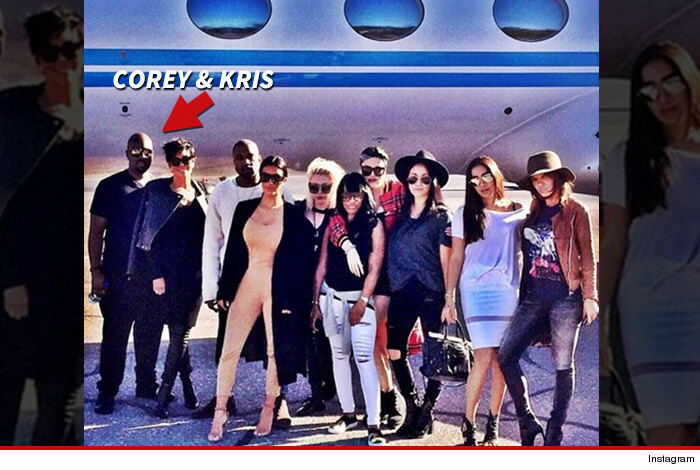 The picture is the latest linking Kris and Corey Gamble -- one of Justin Bieber's road managers -- whom she took to Vegas for Kim's 34th over the weekend. Our Kardashian sources are sketchy on the subject of their relationship ... they say it's "not serious." No one says that about a non-existent relationship, so clearly there is one. One source says, "I wouldn't say they're dating yet." Yet. Here's the other thing ... you don't bring random friends on a private jet to your daughter's birthday.